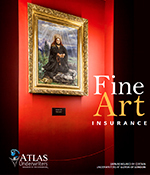 Whether you are an avid collector, a fine art broker, or the owner of an art gallery, Atlas Underwriters can help you find the right fine art insurance policy you need to protect your valuable assets. We offer tailored fine art insurance solutions for a wide range of collectibles and valuables, ranging from paintings and sculptures to antiques, jewelry, and coins. What is Fine Art Insurance? Fine Art Insurance offers protection against loss or damage, no matter the size, type of artwork, or location. Accidents happen at the least opportune moment regardless of the security measures in place. It is important to have the proper insurance in place to secure such a rare investment. Other damage or loss, unless specifically excluded. Our Underwriters are ready to assist you. Our team of underwriters has the insurance experience to address any risk. Knowledge of industry laws and practices helps us ensure your property is insured to market value. New acquisitions receive immediate coverage; up to 25% of the total amount insured (Up to USD $5,000,000) if underwriters are notified within 60 days and insured pays the extra premium to make coverage effective. The underwriters are only liable to the extent that any other valid insurance would fail to cover any claim if this insurance had not been issued. repairing, restoring, retouching, or any similar process; (aridity, humidity, exposure to light or extremes of temperature unless such loss or damage is caused by storm, frost or fire. Loss from or damage in or on unattended vehicles, unless in the custody of a competent professional carrier. Electrical or mechanical fault or breakdown. The amount of the deductible stated in the schedule for each and every loss. Loss or damage or liability directly or indirectly occasioned by, happening through or in consequence of war, invasion, acts or foreign enemies, hostilities (whether war be declared or not), civil war, rebellion, revolution, insurrection, military or usurped power. Loss or damage caused by or resulting from confiscation, nationalisation, requisition or destruction of or damage to property by or under the order of any government or public or local authority. the radioactive, toxic, explosive or other hazardous properties of any explosive nuclear assembly or nuclear component thereof,) nuclear reaction, nuclear radiation or radioactive contamination.